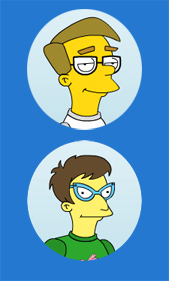 Diana & JRC are lifelong fans of The Simpsons. Their mutual love of the show and its creators make them uniquely well suited as suitors for each other. JRC vaguely recalls seeing the first Tracy Ullman show skits upon their first airing. Although his memory is surely corrected by the rose colored glasses of time, he remembers it being the best part of each episode. As a teen and young adult, he’d religiously watch the show, and with his sister managed to amass a VHS collection of every episode up to about season 13 before he left for the desert and, lost touch without a TV handy. A circle of similarly pop-culture obsessed friends brought him back to the show, but the newer episodes never captured that ‘lightning in a bottle’ feel of the original ten season. He met Diana and they bonded over their mutual love for the Mr. Plow song, and Edna & Seymour’s rejuvenating love for each other. When asked, he’ll probably say “HOMER’S PHOBIA” (Episode 15, season 8) is his favorite based simply on laughs alone, but early stories like DANCIN’ HOMER have a lot of heart too and hold up well. He also loves the self-referential meta qualities to episodes like “THE SIMPSONS 138th EPISODE SPECTACULAR” (episode 10, season 7). The Squeaky Voiced Teen is his favorite character, and of course anything touched by Phil Hartman’s brilliance. People most often compare him to Principal Skinner, an assessment he begrudgingly agrees with. Diana does most of the coding for the site, but she knows that her code is a dog’s code, so please don’t judge it too harshly. On Sunday mornings, the couple play an unofficial game of “how long can we talk and exchange meaningful information only using Simpsons’ quotes”. in 2014 they attended the local comicon as maybe the most obscure Simpsons character ever cosplayed: Dr Hillbilly and the Iron Yuppie. No one at the convention recognized them. Diana and JRC also host a semi-regular Simpsons Trivia contest at their favorite eatery, Bragg’s Factory Diner in Phoenix, AZ.